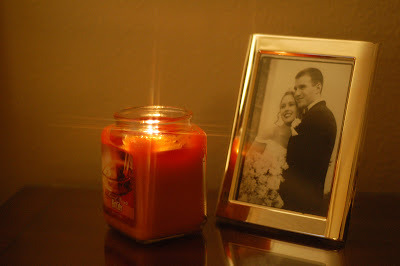 I love candles. My husband knows this and the other night as he came upstairs to bed, he thought of me. And so he brought up a candle with him so I could enjoy it as I fell asleep, the yummy "hot cider" smells filling the room. This man knows me and all the little things that make me feel special and loved. And that is all I have to say about that. Can I just say I love the clean uncluttered bedside table? I've never seen one outside of a showroom. :) What a sweet man! Very sweet and thoughtful man. He's a keeper! Happy Love Thursday!